The IMS is the foundation architecture for the next generation of mobile phones, wireless-enabled PDAs, PCs, and the like. IMS delivers multimedia content (audio, video, text, etc.) over all types of networks. For network engineers/administrators and telecommunications engineers it will be essential to not only understand IMS architecture, but to also be able to apply it at every stage of the network design process. 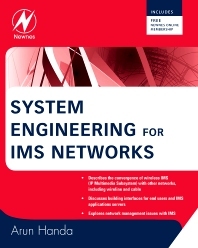 This book will contain pragmatic information on how to engineer IMS networks as well as an applications-oriented approach for the engineering and networking professionals responsible for making IMS function in the real world. Networking, telecommunications, and RF/wireless engineers; network administrators and managers.